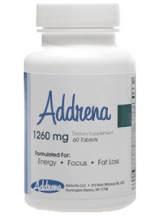 All the main characteristic of the natural energy supplement Addrena are laid out in this review to help potential customers decide whether or not this is a product worth of their money. Marketed as a prescription free pill for improved studying and productivity, Addrena is a blend of natural ingredients that promises to boost energy and focus, as well as promote fat loss. The product claims to be a dietary supplement sold over the counter but with features similar to those encountered in prescription drugs. The most common commercial medicine Addrena is compared to is Adderall. The recommend daily dosage is one pill, preferably cut in half and taken at a 12-hour interval. Before a particularly demanding task a whole extra pill might be ingested, as long as the user never showed any problem with one of the ingredients. Children and pregnant women are not advised to take Addrena. A bottle of Addrena containing 60 tablets costs $39.99. The manufacturer does not offer any bundled purchase or subscription service. Since each Addrena pill contains 1260 mg of stimulant substances, a single dose can be very effective, almost disturbing. When I took it for the first time, following the manufacturer’s directions (half a tablet in the morning, the other half 12 hours later), I felt a rush and a sudden boost of energy. There are no information regarding the long-term effects of this product. As mentioned before, children and pregnant women should not use Addrena. It is also not recommended for people with heart or liver problems, people who suffer from abdominal pains and epileptics. Some of the side effects of this product include dizziness, headaches, insomnia and light-headedness. If any of these symptoms occur a doctor must be contacted immediately. There isn’t a clear return policy for this product, however the manufacturer claims to keep an open channel with its customers. They ask clients to get in touch should any complaint or suggestion arise, and promise to reply to that message on the same day. Due to its high concentration, Addrena is a reliable source of quick energy. Users must be alert, though, not to take it alongside any other source of caffeine (such as soda, tea or coffee) for the dosage might cause problems. It is also a cause of concern the fact that there is no clear policy on returns, not to mention the lack of customer feedback available on the internet. Other products with similar formula and better service are abundant out there.